Tired of Running the Same Old Drills, Players Not Fully Engaged in Practice, and Losing Countless Games? Imagine looking up into the stands and seeing proud parents and spectators looking on as your team walks off the court with big smiles on their faces. ​What's stopping your team from reaching their potential? ​Poor Practice Structure - Too much time is spent on strategy like practicing set plays and drilling five different defensive schemes, instead of focusing on what will really improve your team's in-game performance. Wasting Valuable Practice Time - I witness coaches running inefficient practices multiple times per week (long warmup -> shooting drill -> drink break -> set plays -> long cool down). Wrong Drills For Your Team - All basketball drills need to suit the skill level of the team you're coaching and translate to in-game player improvement. Also, new drills need to be used often to keep practice fresh and challenging for the players. Outdated Coaching Knowledge - Basketball is an extremely complex game. There’s always new things to learn and updated developments to keep track of. ​No Player Workouts - If you want your players to continue to improve outside of team practices, you must assist them by sharing workouts and information. Providing them with skill-focused and fun workouts to use in their own time will make a dramatic difference in improving their game. ​So, What Will Improve Your Team? Most young coaches out there think they make their biggest impact during the game, but it’s just not true. In fact - it couldn’t be FURTHER from the truth! The biggest opportunity you have as a coach to make an impact and help your players is during PRACTICE. After discovering just how vital to coaching great practices are, I was STUNNED to find a complete lack of good information on how to do that out there. I became determined to figure out the secrets to developing players and a winning team. And do you know how much decent and complete information I found? I started to piece together different bits of information in an attempt to make sense of all that I had learned along the way. I started working with other coaches from the BFC community, testing out hundreds of theories to see which ones really worked. And which drills were a waste of practice time. We tested different practice structures to see which ones were simple and easy to create while still providing maximum benefits to the players improvement. Plus trying out a ton more ideas, theories, practices, and structures… determined to find out THE BEST way to practice (as opposed the most popular ones). "Wow, Coach Mac has outdone himself again. The biggest struggle for youth coaches is having meaningful practices that are both fun and productive for the player. What Coach Mac has done is break down the various aspects of the game into 5 skills (passing, dribbling, rebounding, shooting and defense) with over 30 drills per skill. This allows me as a coach to not have to do the same drill over and over again which helps keep it fun and the kids more engaged. He then went out of this world by having a box of “small sided games” I can choose from – the small sided games allows the skill to be performed in a game like situation which turbo charges the kids development. I started a boys team a little over 2 years ago, they had never played basketball before and we started off 0-18 (we got beat one time 48-2 and we were lucky to score the two points) – fast forward to today we won our league and compete in high end tournaments and do very well. Much of our success can be attributed to Coach Mac and his drills BUT also his generosity in helping if I have questions. I recommend this Championship Coaching Course to those coaches that want the absolute best for their players." Start to develop better players (and quickly!). Greatly improve your ability to coach (which is a plus to you, your team, and their parents). And finally start winning more games! It’s taken years of development, decades of basketball experience from multiple coaches, studying, practicing, and coaching to put this course together. 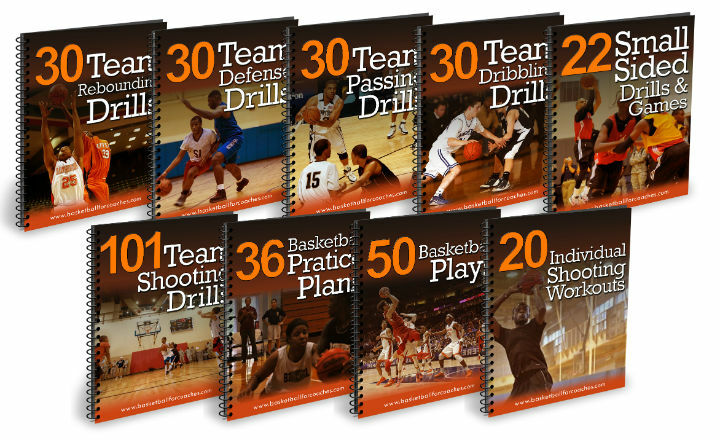 You’re accessing a resource packed with hundreds of time-tested, well-researched drills, practice plans, and more. More than just a list, you’re getting a deep dissection of every single practice plan and basketball drill that I know is effective for developing players. The drills and practice plans are divided into multiple sections and you’ll see crystal-clear diagrams showing you exactly how to perform every single drill and play. Learn the exact things you should look for and tell your players during each drill to maximize their performance. There’s no complicated lingo and everything is broken down in simple terms even a complete novice could understand and apply. Youth Coaches - Struggling to come up with practice plans and drills? This course will give you the exact drills and practice plans you need to ensure you set your team up for success. HS and College Coaches - This course will let you take your practices to the next level with new and improved structure and basketball drills. 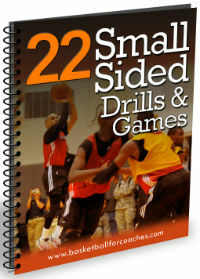 243 Super Effective Basketball Drills (yes, two hundred and twenty one) - All divided into specific drill categories including shooting, rebounding, passing, and more. 821 Value-Packed Pages of Content - Including workouts, drills, practice plans, coaching points, hundreds of diagrams, and much more. A Private Basketball Coaching Community - Our very own private group where we can share coaching strategies and tips with each other! Youth players are not like professional athletes. We can't expect them to use the same few drills over and over again while continuing to have fun and improve. Like many coaches, I used to use the same few drills over and over again and my team experienced less improvement as a result. I spent years collecting, creating, and testing a wide variety of shooting drills with a select few fellow coaches with great knowledge of the game. This is the collection of the best shooting drills we tested. Never again will you struggle to find an exciting shooting drill that will develop your players, keep them engaged, and up their game. While height does play a factor in rebounding, there are other traits and skills that are far more important than any height advantage! And I'm going to teach you what they are! 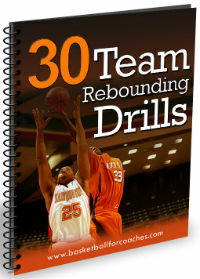 Any team CAN be a great rebounding team by utilizing the right drills and learning from the best rebounding methods. The #1 trait that ALL great rebounders possess - Rebounding isn't rocket science. And this trait that sets the best rebounders apart has nothing to do with positioning or technique. The 3-step rebounding method players MUST use every time a shot is taken. This is the simplest method I've found to teach players of ALL ages how to rebound on the defensive end of the floor. 30 Rebounding Drills - Each broken down into: How the drills works, purpose, setup, instructions, variations, coaching points. Being a great defensive team is crucial if you want to have any success on the basketball court. Throughout your practices, your team needs to consistently practice being a great team on the defensive end of the floor. EXACTLY what you should be emphasizing to your players on defense - Even when they complain about their lack of athleticism (and how they can still be a great defenders). Why you should NEVER have a bad defensive night. 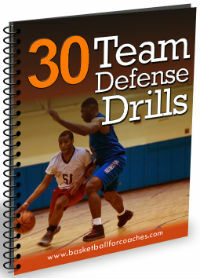 30 defensive drills in an easy to understand and use format - Practice these and you’ll have your players playing lockdown defense every single game. If you want your team to take good shots on offense, your players must be able to move the basketball around the court quickly and effectively. A team that can pass the basketball at a high level forces the defense to rotate and puts them in difficult situations to defend. The better your team can pass the ball, the more opportunities your team will have to put points on the scoreboard. Why being a great passing team is so important. 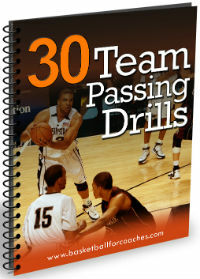 30 passing drills with specific diagrams and step-by-step instructions that will have your players playing REAL team basketball - Including specific coaching points you need to look out for to make sure your team gets the most out of every drill. But they're especially important for youth basketball coaches! They keep all players involved at all times. It's the easiest skill for players to start learning. Set the right foundation for your youth teams (or sharpen the skills of your older team) with these 30 Team Dribbling Drills. Two important points you MUST keep in mind when teaching dribbling drills. Why being able to dribble with both hands is crucial for young players. 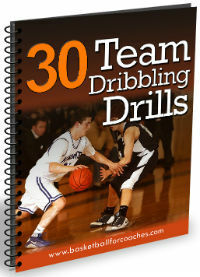 30 dribbling drills that will keep all players active and enjoying practice! - While at the same time teaching them valuable skills, techniques, and strategies they’ll be able to take advantage of in real games. Incorporating small-sided games into your practice plans is an absolute must for coaches in youth sports today. Breaks down the game into chunks. Eliminated defensive presses and zones. Teaches players when to use a skill. The answer to "Why are small-sided games so important?" The best drills/games to use depending on how many players you have and how much ​court space you have available. 22 small-sided games you can use to allow players to compete in game-like scenarios. When I first started coaching, it would take at least 1.5 - 2 hours every single time I created a practice plan. To save you this hassle, I've created 36 complete practice plans that you can immediately print off and use with your team. Time - How much time you plan to spend running each drill. Drill - Which drill you plan to run with a brief description. Coaching Points - The points of emphasis you must remember throughout the drill. 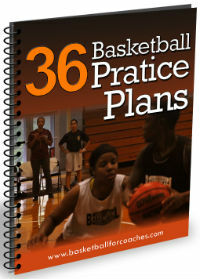 That's 36 basketball practice plans to suit all ages, skill levels, and lengths of practice. Using these practice plans will GUARANTEE that your practices will be much more effective and you'll never run out of ways to continue to challenge your players. A complete brea​kdown of the EXACT 5-part practice structure I use and WHY each part is super important. The two offense and two defenses I recommend for all basketball teams. 5 ways to ensure your players LOVE coming to practice. As the coach, it's your responsibility to put your players in positions that give them the best opportunity to score. This is commonly done through an offense or by running set plays. 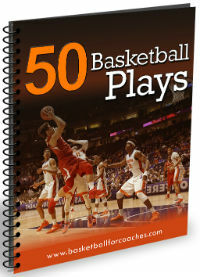 This eBook contains 50 powerful basketball plays that you can implement on any team you coach. Because every team has their strengths at different positions and each player has specific ways they prefer to score the basketball. I guarantee you'll find several plays contained within this eBook that will put your team's best player in their favorite position to score. The EXACT number of plays you should use on your basketball team. 3 incredibly important tips you must follow to successfully complete set plays. Why you should NEVER select plays because you think they 'look cool'. It goes without saying that your players cannot become great shooters in the couple of hours of team practice they participate in each week. To develop into a great shooter, players must be shooting outside of team practices in their own time as well. But the problem is that most players have no idea what they should be doing when training by themselves! 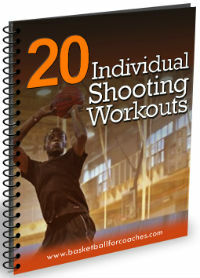 These shooting workouts will ensure that when your players are out practicing by themselves, they're ACTUALLY improving their shooting abilities - instead of just messing around. For a full 3 months - 90 days - after your purchase, you will have direct access to my PERSONAL email address (usually only used by family and friends). You will be able to email me at any time with any and all questions you have in regards to coaching basketball or simply basketball in general. Want me to review your practice plan? Sure thing! Want me to assist you with deciding which drills to use? Cool. Having difficulty with parents and need advice? I'll help you. Feeling lost in the whole coaching experience? I'll point you in the right direction. 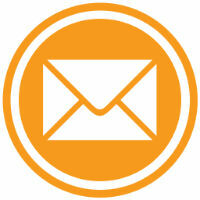 I will personally assist you with anything you need! Have a specific question you want to ask a group of basketball coaches? Perhaps you have a got a practice plan you want to discuss or you're experiencing a problem with one of your players and you want to see if any other coaches have experienced the same thing? 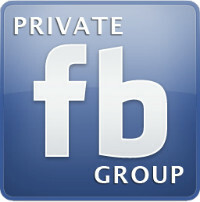 You’ll have access to a private FaceBook group where coaches from all over the world are sharing ideas on all aspects of basketball. As we're getting into basketball season, I'll be in there every day to make sure all questions are answered, to share my thoughts, and to give advice to anyone who needs it. You’ll become a part of a private basketball coaching community. A community that’s always there to help each other out and test new ideas! Do your players run around the court like headless chickens when they're on the offensive end of the court? Teaching your team an simple and effective offensive structure is one of the hardest roles of a basketball coach at any level. 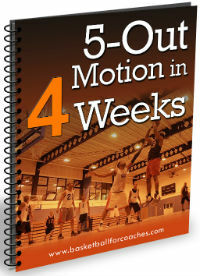 I'll give you a step-by-step guide you can use to implement the 5-Out Motion offense on your team in only 4 weeks. After these four weeks of practice, your team will be able to effortlessly execute a continuous motion offense with many options. A Complete 5-Out Motion Guide. "Man-to-Man defense is too hard to teach to my players. They just don't get it! They're not smart enough to plan man defense yet!" Defense isn't hard to teach -- when you know how to teach it correctly. Most coaches have absolutely no idea how to teach man-to-man defense to their team. They'll simply throw their kids out on the court in a 5-on-5 game and tell them to 'stick with your player'. Completely forgetting to teach their team how to rotate correctly, how to deny the basketball, which direction to force their player, etc. Which specific drills to use and which order to use them in to ensure your team quickly learns the man-to-man defense. You'll never have to worry about your players being 'lost' on the defensive end of the court again. 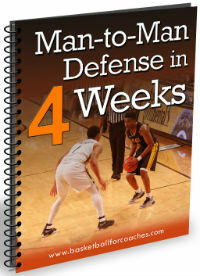 A Complete Man-to-Man Defense Guide. The myth that you MUST spend years and years coaching before you're experienced enough to develop players quickly and coach a successful basketball team. You can skip many years of trial and error by learning from the experiences and mistakes other coaches have made. By signing up to a proven course, you will receive the exact drills and practice plans that have been proven to develop players and teams. This will save you years of trial and error. Sign up for the 'Championship Coaching Course' and immediately receive the exact drills and practice plans that will improve your team and put you on the path to success. Prove to the players and parents that you can lead a team with confidence. Develop the skills of every player on your team. I am 100% sure you will absolutely LOVE this course, and both you and your team will get a massive amount of value from it. If you have ANY problems, or you’re unhappy for ANY reason with this course - shoot me a quick email anytime within the next 30 days and you’ll receive a full and prompt refund. If you don't see improvements in your team from applying the content of the course, you get your money back. What are other coaches saying about the Championship Coaching Course? I had no expectations of going undefeated, 12-0, and winning the championship in a league with teams who were bigger, stronger and more experienced. But that's exactly what happened! There is absolutely no doubt in my mind that Coach Mac's system paved the way to that success. I followed his practice plans religiously. Our team had the highest morale in the league, and it wasn't just because we were winning (although that probably didn't hurt). 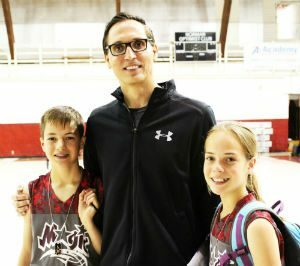 His drills and practice organization make practices FUN, all while valuable basketball skills are being engrained into the players. I don't believe in "instant" results, and don't expect any rational coach to either. However, Coach Mac's program, combined with the discernment to recognize what your players need and when they need it, will no doubt enhance the skills of your players, make the game enjoyable for you and the fans, and create a love of basketball that will sustain your players for years to come. "Whether you're a new coach just starting out, or have coached for 11 years like I have, if you're not getting better and learning something new every season you're falling behind. From drills to practice plans, Coach Mac's Advanced Championship Course has the materials you need to continue to get better, keep your practices fresh, and improve your players." The Championship Coaching Course has formed an integral part of my coaching program in 2017. The practice plans are well thought out and can be printed and used as a basis for any level of team or length of training session. The individual workouts are also a big hit with the players as they improve their own shooting and push themselves to improve their best score. I’ve been coaching for nearly 20 years, and these tools just make the job so much easier! I've only been through a small portion of the material so far but I am purposely going slow with it, and really thinking things through as I adapt many of your practice planning ideas and drills into my preparation for the upcoming season. I am really learning a lot, and wish I would have bought your course prior to last season (my first as a HS head coach). I really appreciate the immense amount of work you have put into this. I already feel a little more confident and prepared than last year. Thanks! Being a first time coach this coaching course has really given me confidence with coaching my under 8 boys. There is a massive variety to put together yourself as well as some really good practice plans already put together by Coach Mac. I would recommend this to any coach looking to add to there coaching knowledge. 1. "I've only just started coaching recently, is this course suitable for people new to basketball coaching?" Every single resource within the Championship Coaching Course (drills, practice plans, plays) is broken down and explained in terms that even a complete basketball novice could understand. There is no complicated lingo. And on the off-chance that something does trip you up, you can send an email straight to the support email and we'll make sure to clear things up for you as soon as possible. 2. "What age groups is the Championship Coaching Course designed for?" 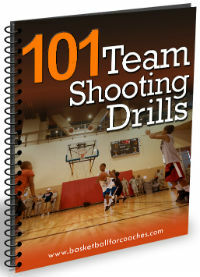 The drills included in the course primarily targeted at all youth basketball and high school teams. All of the drills include a 'variation' section where I list different ways you can adjust the drill to make it easier or harder depending on the age and skill level of the team you're coaching. This is convenient because it means the same drills that can be used by players beginning to learn the game can be adjusted to challenge players at the high school level and above. 3. "What exactly is the Championship Coaching Course? And how does it work?" The Championship Coaching Course is a series of 9 PDF's that will be available for you to download immediately after purchasing. You will also receive access to a private FaceBook group for the purchasers of the Championship Coaching Course and also my personal email address to reach out any time you need. You will have lifetime access to each resource and have the ability to download each eBook and print them if you choose to. 4. "How detailed are each of the drills and the practice plans?" Every drill has been thoroughly broken down and explained in terms that even someone who has never stepped foot on a basketball court could understand. 5. "Seriously, is the Championship Coaching Course right for me?" If you've made it this far down the page and you're still not sure if it's right for you, let me explain the 2 types of coaches this course can help. If you've never coached before but you're looking to start, this course will provide you with the exact drills and practice plans to use to ensure you're setting up your team for success. 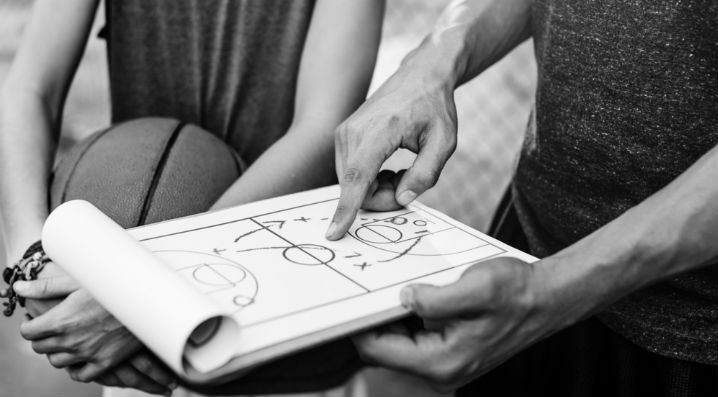 ​If you're already coaching, this course will allow you to upgrade your practice by providing you with new and improved basketball drills to add variety to your practices and further improve your players.